As millions of U.S. students start school, and economists and educators grapple with how best to prepare workers for jobs in today’s economy, there is evidence that a majority of Americans look to elementary and secondary schools to provide the building blocks people need for a successful career. Six-in-ten adults say the public K-12 education system has a lot of responsibility in making sure the U.S. workforce has the right skills and education to be successful in today’s economy, according to a Pew Research Center survey conducted in association with the Markle Foundation in 2016. The only entity or institution that more people say has a lot of responsibility is “individuals themselves,” cited by 72% of adults. Americans express a bit more ambivalence toward the role of colleges and universities in workforce preparation, with around half of adults (52%) saying these higher-education institutions should have a lot of responsibility in making sure workers have the right skills and education to succeed. About half (49%) say employers should have a lot of responsibility in this role, but people are less likely to assign a lot of responsibility to state (40%) and federal governments (35%). Views on who is responsible for workforce preparation vary by party. Democrats and Democratic-leaning independents are more likely than Republicans and Republican leaners to attribute a lot of responsibility to K-12 schools (66% vs. 54%), and this holds true for colleges and universities (58% vs. 44%). But Republicans and Republican leaners (77%) are more likely than Democrats and Democratic leaners (70%) to ascribe a lot of responsibility to individuals. Racial and ethnic minorities are also more likely than whites to assign schools a lot of responsibility. A majority of Hispanics (63%) say colleges and universities have a lot of responsibility in workforce preparation, compared with around half of whites (49%). And around two-thirds of blacks (65%) and Hispanics (66%) assign a lot of responsibility to K-12 schools, versus 57% of whites. Although the public is somewhat ambivalent on whether colleges and universities are responsible for preparing the American workforce, a majority (67%) say a four-year degree prepares someone at least somewhat well for a well-paying job in today’s economy. Democrats and Democratic leaners were more likely than Republicans and GOP leaners to say this (73% vs. 62%) in the 2016 survey, though Republican views on how colleges and universities affect the country have changed dramatically over the past two years. Vast majorities of those who graduated with a four-year degree say their education was at least somewhat useful in providing skills for the workplace, job opportunities and personal growth. Yet views on what the main purpose of college should be also vary by party. 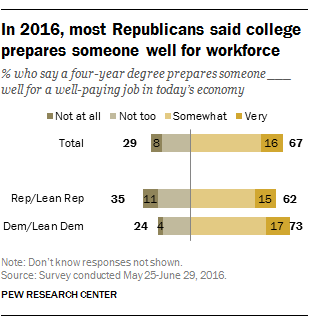 About six-in-ten Republicans and Republican leaners (58%) say college should be for teaching specific skills and knowledge that can be used in the workplace. Democrats and Democratic leaners, on the other hand, are split: 42% say the main purpose of college should be to help an individual grow personally and intellectually, while 43% say it should be to teach specific skills.